Reflections on the metaphysics and epistemology of classification from a distinguished group of philosophers. 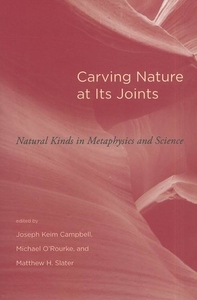 Contemporary discussions of the success of science often invoke an ancient metaphor from Plato's Phaedrus: successful theories should "carve nature at its joints." But is nature really "jointed"? Are there natural kinds of things around which our theories cut? The essays in this volume offer reflections by a distinguished group of philosophers on a series of intertwined issues in the metaphysics and epistemology of classification. The contributors consider such topics as the relevance of natural kinds in inductive inference; the role of natural kinds in natural laws; the nature of fundamental properties; the naturalness of boundaries; the metaphysics and epistemology of biological kinds; and the relevance of biological kinds to certain questions in ethics. Carving Nature at Its Joints offers both breadth and thematic unity, providing a sampling of state-of-the-art work in contemporary analytic philosophy that will be of interest to a wide audience of scholars and students concerned with classification.